!! OMG thingie eating banana !! 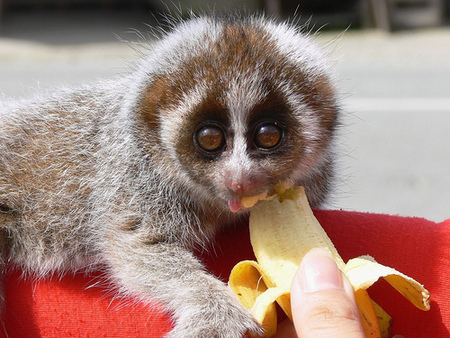 These pictures of a “Slow Loris” eating a nanner make me uncomfortable. Maybe it’s cause the creature looks like it lives up to its name and eats real slow while staring at you and every once in a while it stops to say something truly terrifying. 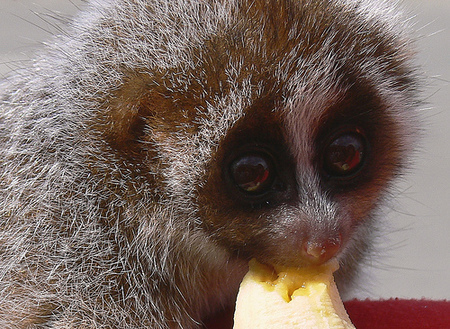 Something like “This banana tastes like my brother’s entrails.” Then it goes back to eating and staring. Maybe a little giggle for no apparent reason every once in a while. Am I right? Oh and it has a chipper English accent, like the blue worm from Labyrinth. Be the first to comment on "OMG thingie eating banana"